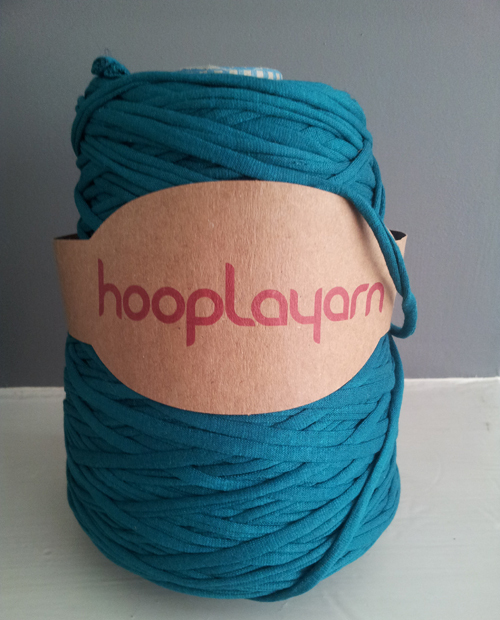 I recently bought some Hoopla yarn from a local craft show. This eco yarn is created from the edges of cotton and jersey fabric that would otherwise be thrown away. The yarn is very chunky and can be knitted using a 10mm needle or crocheted using a 9mm or 10mm hook. 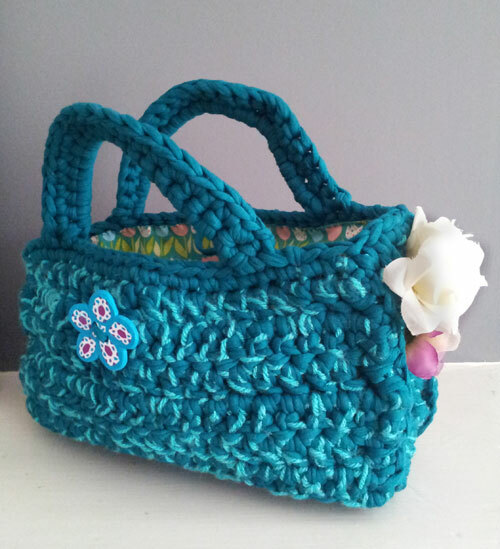 Having pondered on what to make for while I decided to have a go at crocheting a small bag. Initially I thought the colour of the yarn looked a little ‘flat’ on its own, so I mixed it with a turquoise DK wool to add a bit of texture to the look. Using a DC stitch, I crocheted two oblong panels for the front and back of the bag and then crocheted a thin oblong that I wrapped around the sides and base to give the bag some added depth. 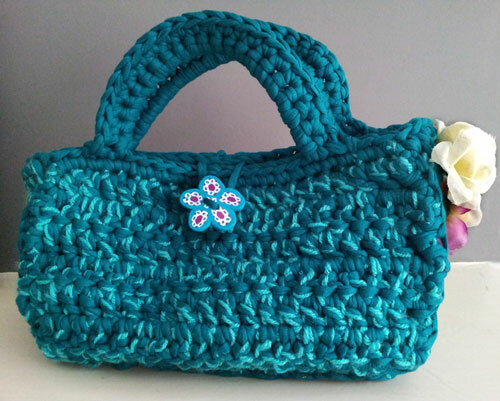 I stitched the bag together using Hoopla yarn and a blanket stitch on the right side and then crocheted a row of DC’s around the top edge. The next step was to make the handles. I measured the width of the bag to work out where the handles should be positioned. I started by making a row of chain that measured the length of the handles. For the next row I made DC’s ‘under’ the chain (I added a couple more DC’s than chain stitches here to give a neat, strong edge) then I finished with a row of DC’s into each DC. To join the handles I made a slip stitch at the end of each row into the bag as I went along. After sewing in the loose ends inside the bag I wanted to line it with some contrasting cotton fabric. I made a paper template for the front, side and base and cut out my fabric leaving a 1cm seam. After machining the pieces together I put the fabric inside the bag, folded a hem along the top edge and hand-stitched the fabric to the bag using a simple running stitch. 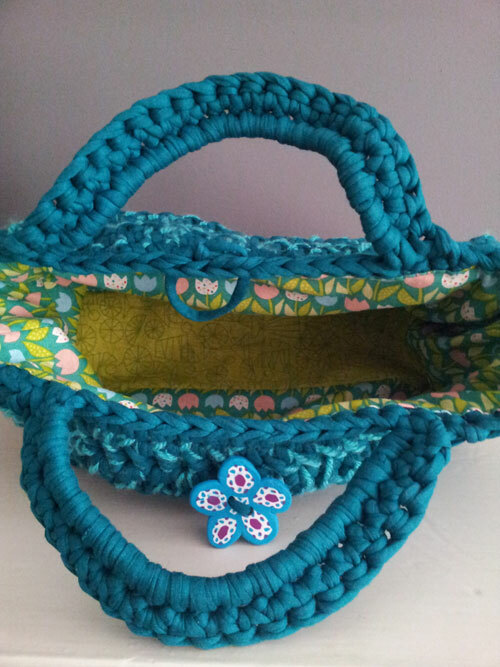 Hoopla yarn bag, lined with a mix of floral/green fabrics. For the finishing touches I added a loop and a button that I made from polymer clay (more on this later!) and a couple of flowers.